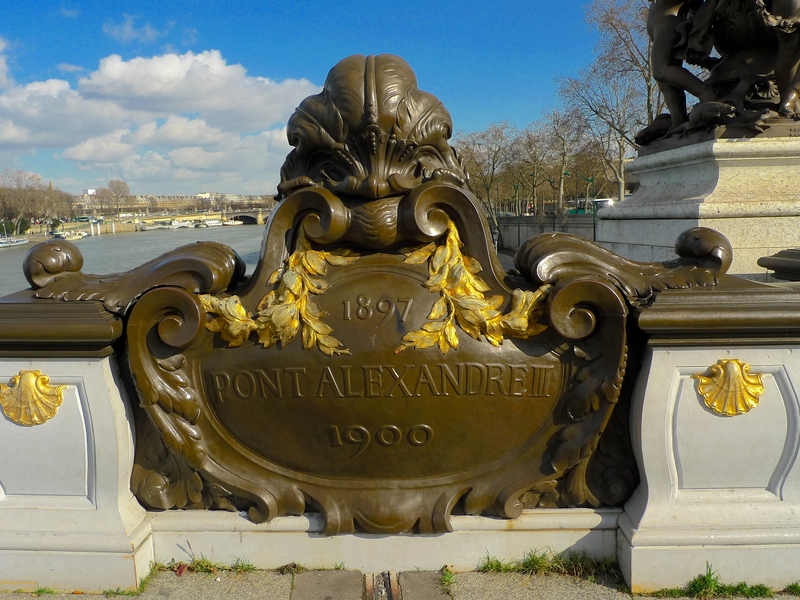 MORE RESEARCH FOR my Paris Bridges project took me to the most majestic and extravagant bridge in Paris, Pont Alexandre III. 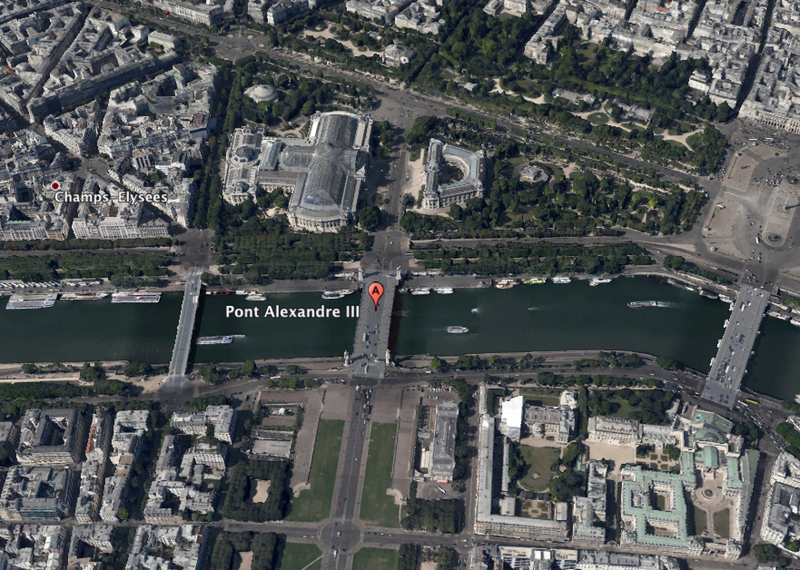 Named after the Russian Tsar, Alexandre III, one of the architects of the Franco-Russian Alliance between the French Third Republic and the Russian Empire, the bridge connects the Champs-Élysées and the Grand and Petit Palais on the right bank with the Hôtel des Invalides on the left bank of the Seine. 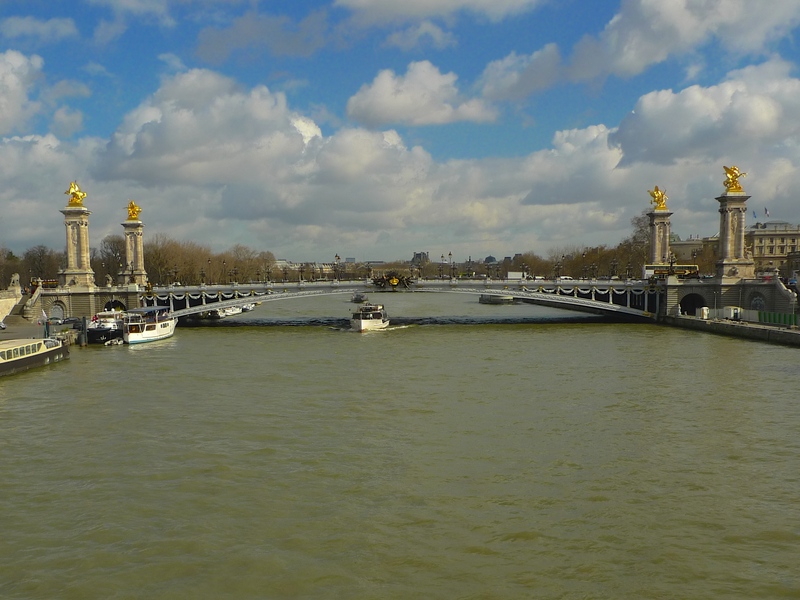 Pont Alexandre III was conceived to provide an additional crossing over the Seine to relieve the pressure of the increasing traffic flow across the neighbouring Pont de la Concorde. 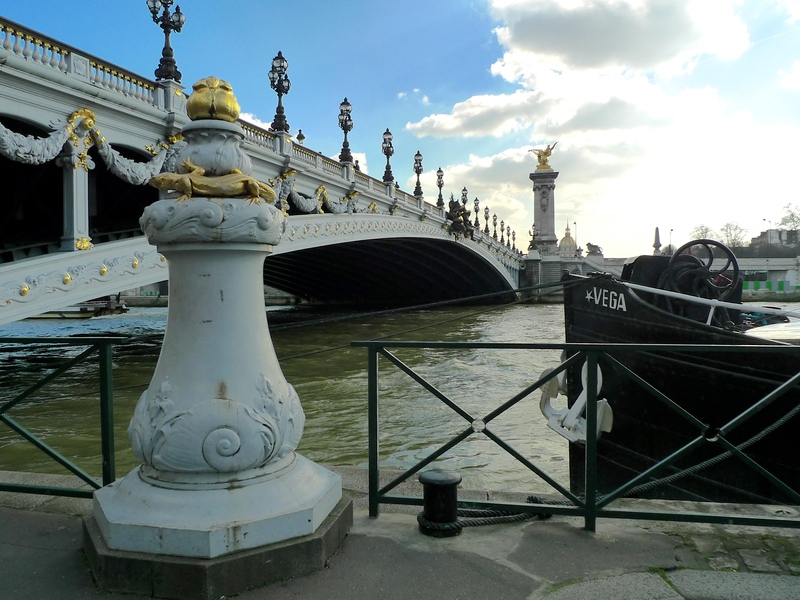 The foundation stone of the bridge was laid on 7th October, 1896 by Tsar Nicolas II, son of Alexandre III, construction work began in May 1897 and the bridge was inaugurated on 14th April, 1900 by Emile Loubet, President de la République to coincide with the 1900 Exposition Universelle held in Paris. Exposition universelle de 1900, Paris. 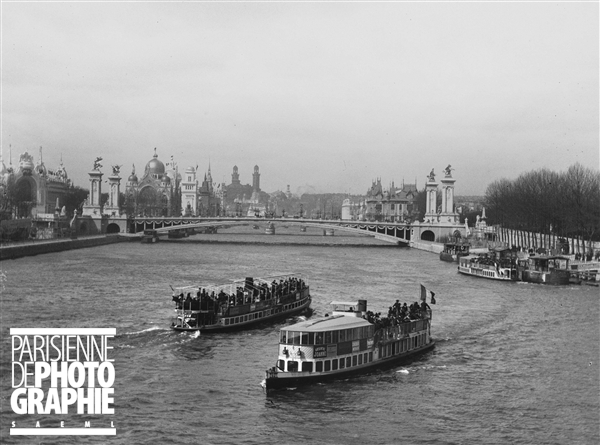 La Seine et le pont Alexandre III. 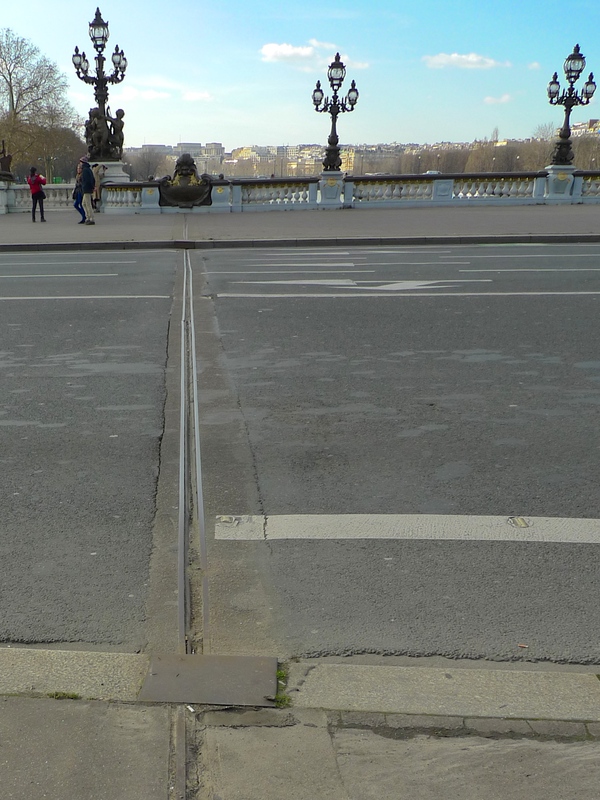 Because of its prestigious location the architects chosen to design the bridge, Joseph Cassien-Bernard and Gaston Cousin, were faced with the challenge of coming up with a structure that prevented the bridge from obscuring the view of both the Champs-Élysées and the Hôtel des Invalides. 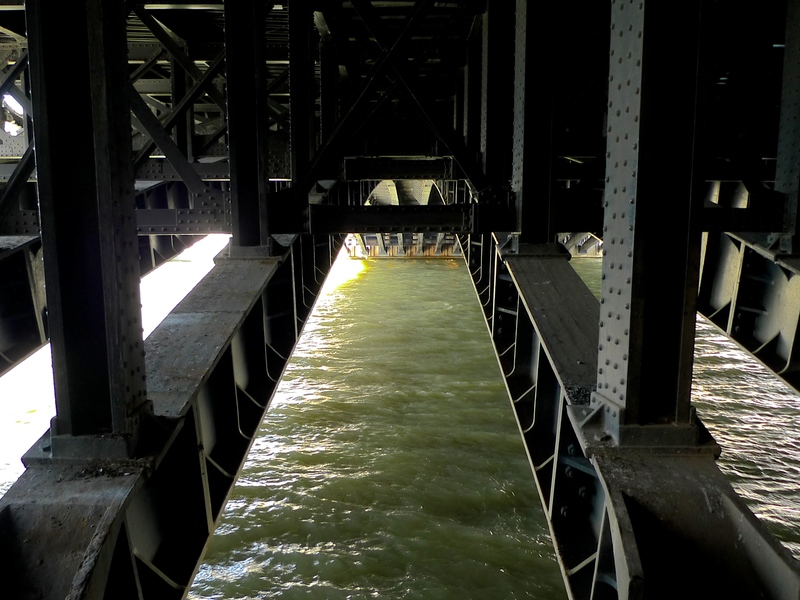 In order to achieve this they designed a three-hinged metal arch bridge, 160 metres long and 40 metres wide, comprising a 107 metre single metal arch spanning the river with two masonry viaducts on the banks. To avoid obscuring the view on either side of the bridge the central arch was kept low at just 6 metres above the water level but, in order to achieve this, very large abutments with deep foundations were required on either side. These abutments whose sides run parallel to the axis of the bridge are 33.5 metres long on one side and 44 metres on the other. Both abutments sink approximately 20 metres underground. It was the responsibility of the engineers Jean Résal and Amédée d’Alby to turn the plans into reality. They built the abutments using compressed air caissons, the same technique that was used to construct the foundations of the Tour Eiffel and much of the Paris Métro. 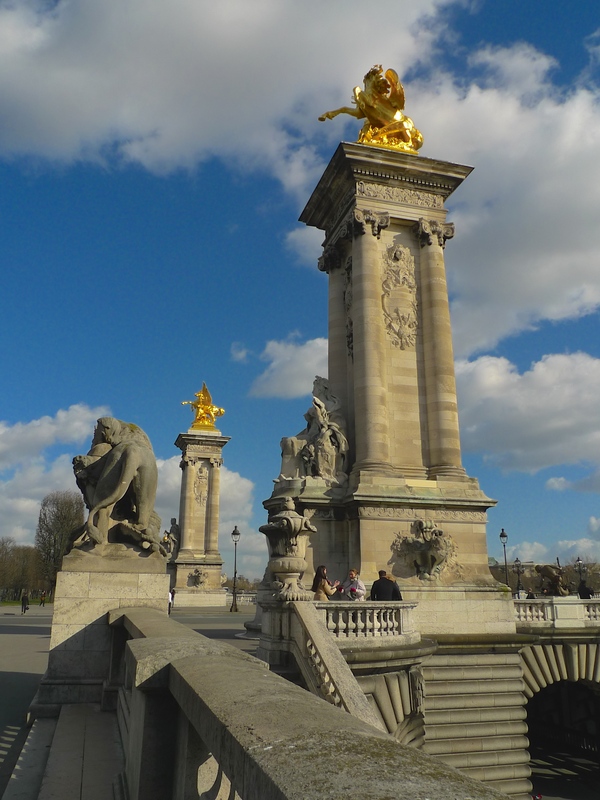 But what was revolutionary about the construction of Pont Alexandre III was that the metalwork for the bridge was prefabricated. The metal was forged at the Creusot works in Saône-et-Loire in eastern France and then shipped by barge before being mounted into position by a huge crane that spanned the river. This was one of the first examples of prefabrication being used in the construction industry. 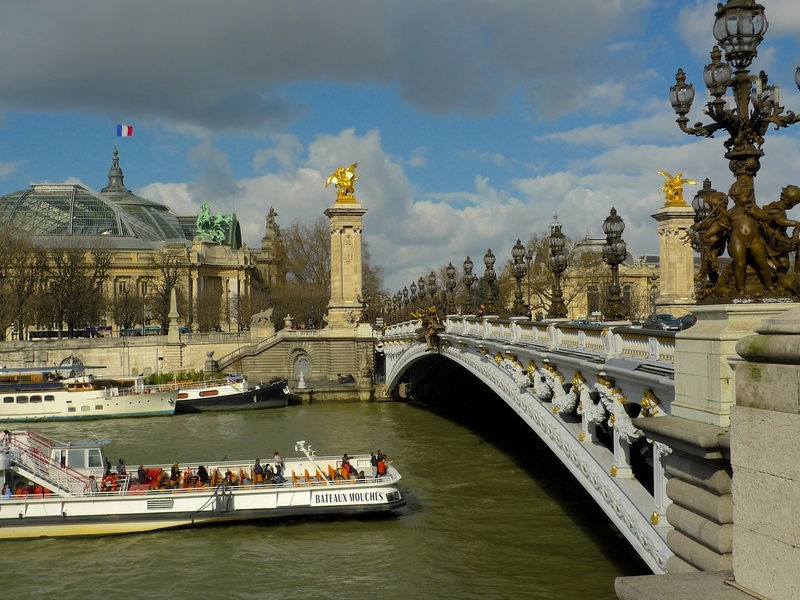 An interesting fact not always noticed by users of the bridge is that Pont Alexandre III does not in fact span the Seine in a direct line from the Champs Elysées to Les Invalides, it runs slightly obliquely although most people scarcely notice this. 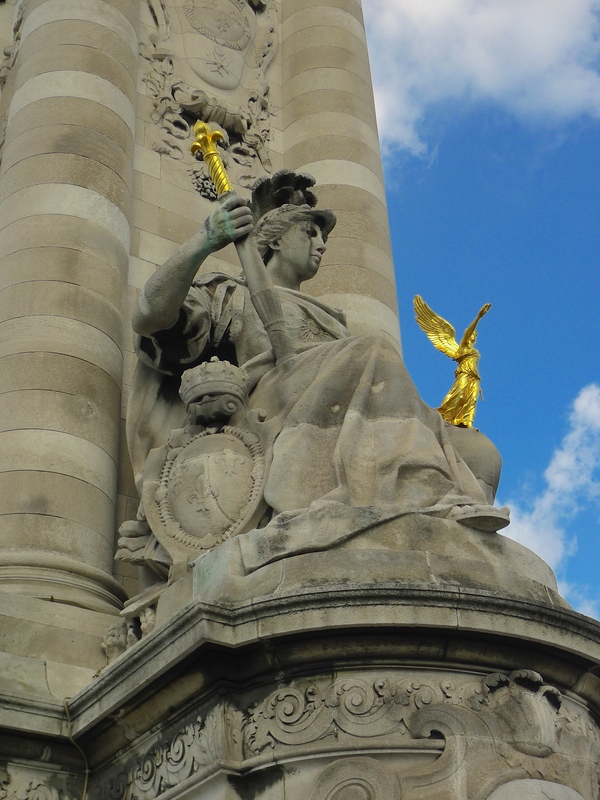 At each corner of Pont Alexandre III are 17 metre high decorated granite columns. 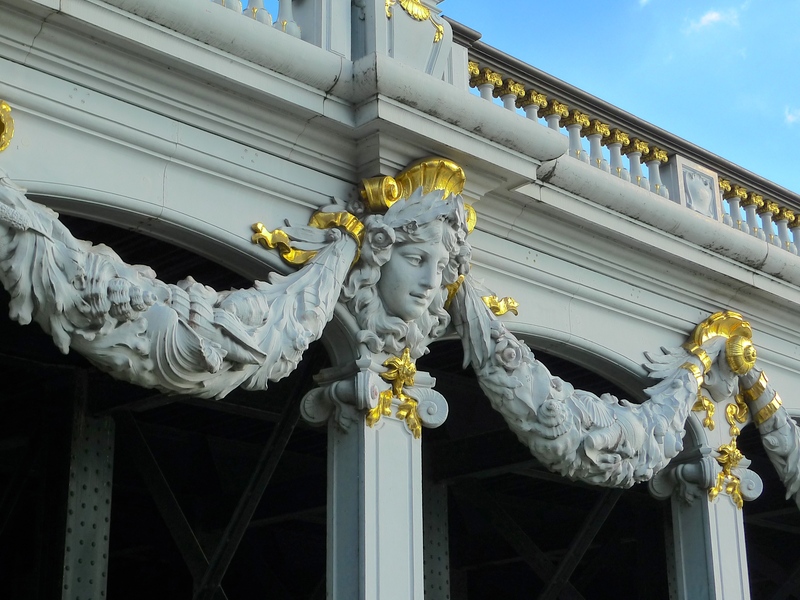 These columns are more than just decoration though, they are built on top of the abutments on either side of the river and provide a stabilising counterweight to the bridge’s low-slung metal arch. Each of the columns is topped with a gilt-bronze statue representing a ‘renommée, a Greek goddess personifying an allegorical character of public or social recognition. 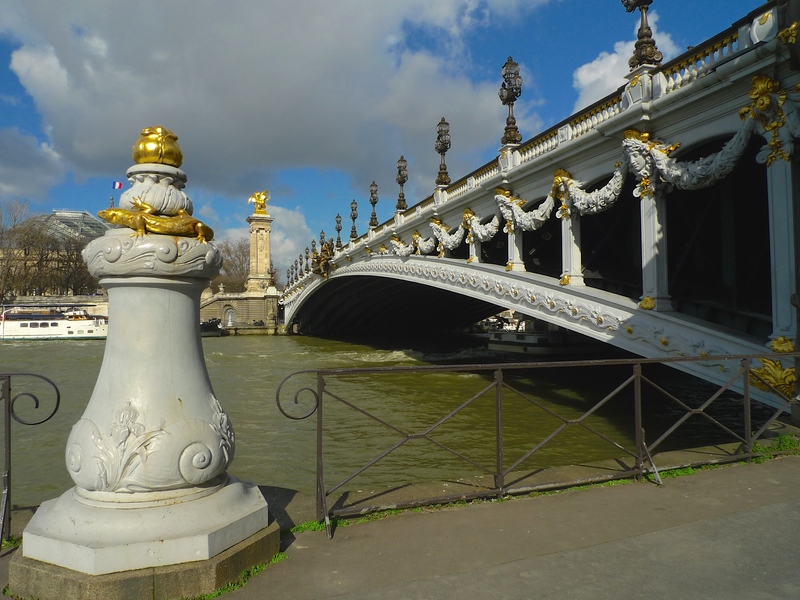 On top of the two columns on the Right Bank, the upstream statue is La renommée des arts, by Emmanuel Frémiet, and downstream, La renommée des sciences, also by Emmanuel Frémiet. 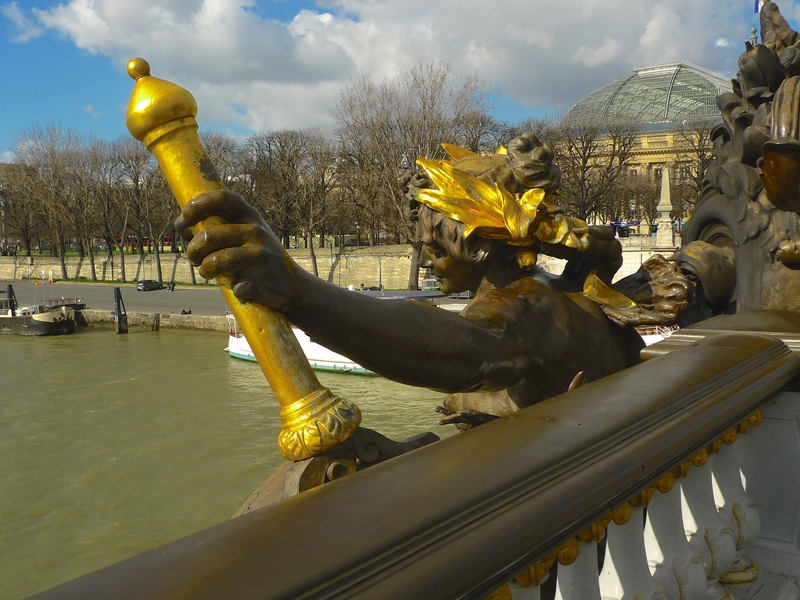 On top of the Left Bank columns, the upstream statue is La renommée au combat, by Pierre Granet, and downstream, Pégase tenu par la Renommée de la Guerre, by Léopold Steiner. There is more decoration on the base of the columns. On the Right Bank upstream, La France du Moyen Âge by Alfred-Charles Lenoir, and downstream, La France moderne by Gustave Michel. On the Left bank upstream, La France à la Renaissance by Jules Coutan, and downstream La France sous Louis XIV by Laurent Marqueste. La France sous Louis XIV by Laurent Marqueste. Two decorative features in the form of Nymph reliefs in the centre of the bridge on either side signify the Franco-Russian Alliance. On the upstream side, the Nymphes de la Seine avec les armes de Paris, and on the downstream side directly opposite, the Nymphes de la Neva avec les armes de la Russie. Both were made from hammered copper and gilt-bronze by Georges Récipon. 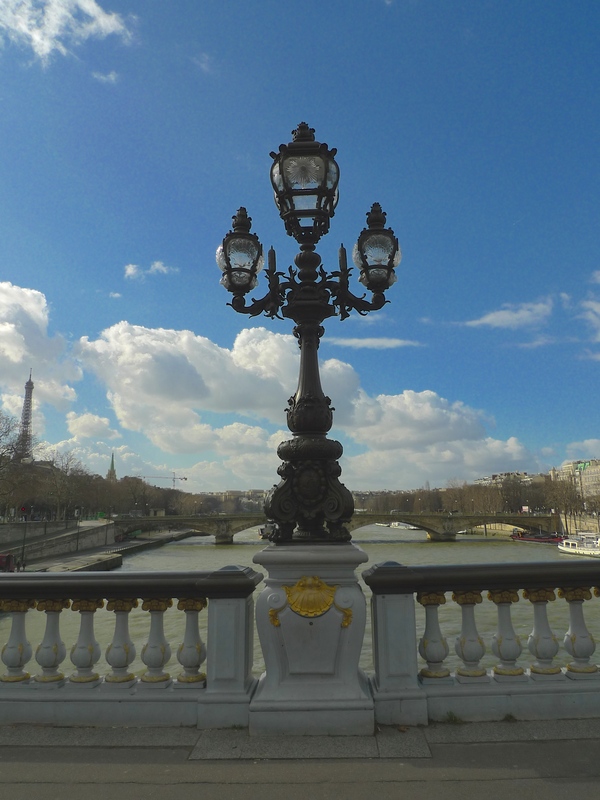 One of the features of Pont Alexandre III much beloved by film directors (both Woody Allen’s Midnight in Paris and the James Bond film A View to a Kill, with Roger Moore as Bond, used the bridge as a backdrop) are the candelabra style Art Nouveau street lamps that line both sides of the bridge. 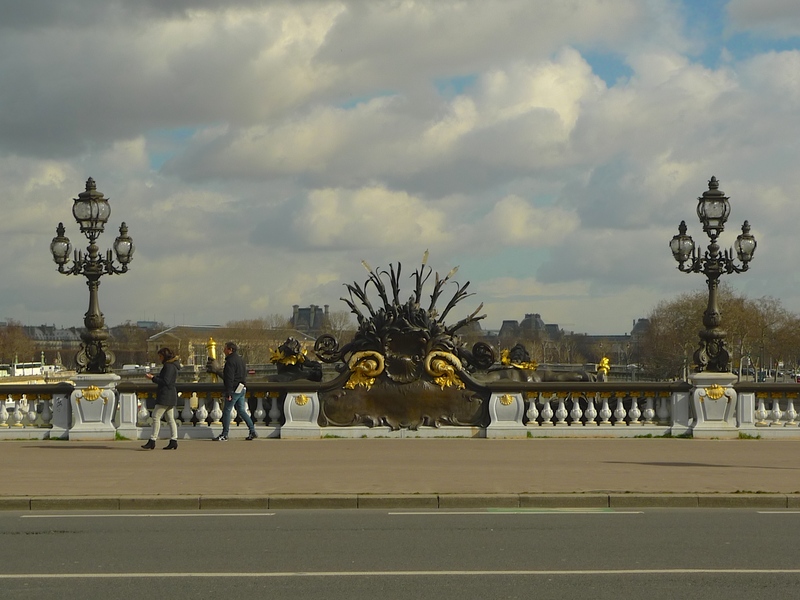 I began my exploration of the sounds of Pont Alexandre III on top of the bridge. The bridge is 40 metres wide and carries six lanes of traffic, three in either direction. Save for a short stretch of pavé at each end, the roadway has a smooth surface so it seemed that the sounds of the traffic passing would likely be fairly uninspiring. That is until I found an expansion joint crossing the road and it was from here that I chose to record. It wasn’t until later that I discovered that this expansion joint would feature as one of the unique sounds of this bridge – but not from this recording position. 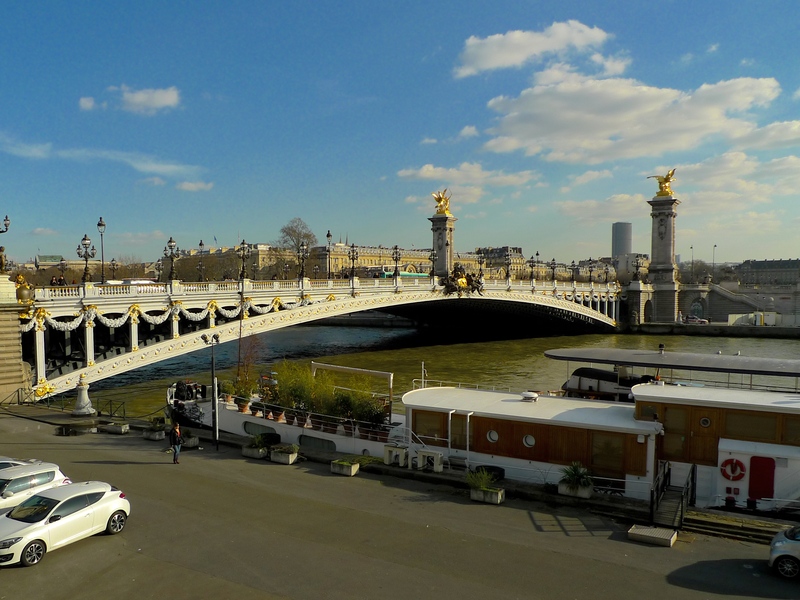 Next, I wanted to explore the sounds around the bridge and to do that I walked down from the top of the bridge to the Port des Champs-Élysées on the Right Bank where I found boats berthed along the quay. 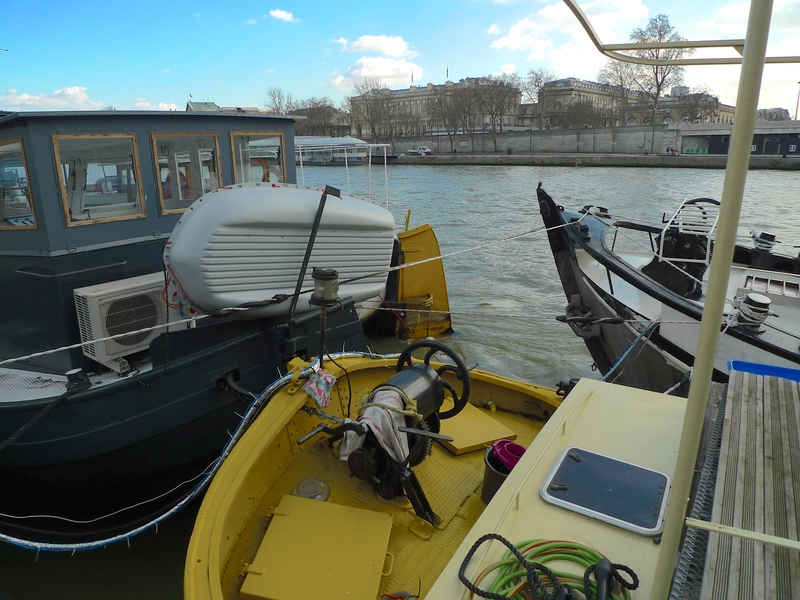 I began recording on the upstream side of the bridge where I found three boats berthed together and then I walked under the bridge to the downstream side where there were some larger boats. The sounds on the upstream side are particularly unusual because the sound of the mooring ropes straining as the boats shift with the waves sound exactly as if the boats are actually breathing. On the downstream side it is the sounds of the wash, the sonic footprint left by the passing tourist boats and industrial barges, that feature. Having now captured the characteristic sounds of the bridge from on it and around it I still hadn’t found any sounds that seemed to be unique to the bridge, sounds that distinguish this bridge from any other Parisian bridge. So I decided to cross the bridge to the quay on the Left Bank and explore underneath the bridge to see what I could find. The return of the expansion joint! From under the bridge I found that the rather mundane expansion joint in the roadway on top of the bridge had now become a significant feature of the soundscape. In the tunnel-like, reverberating, surroundings its sonic texture had changed completely from its clipped tones on the bridge. Now it seemed to be speaking with authority, demanding to be heard above the wash of the water, the river traffic and the passing school children. 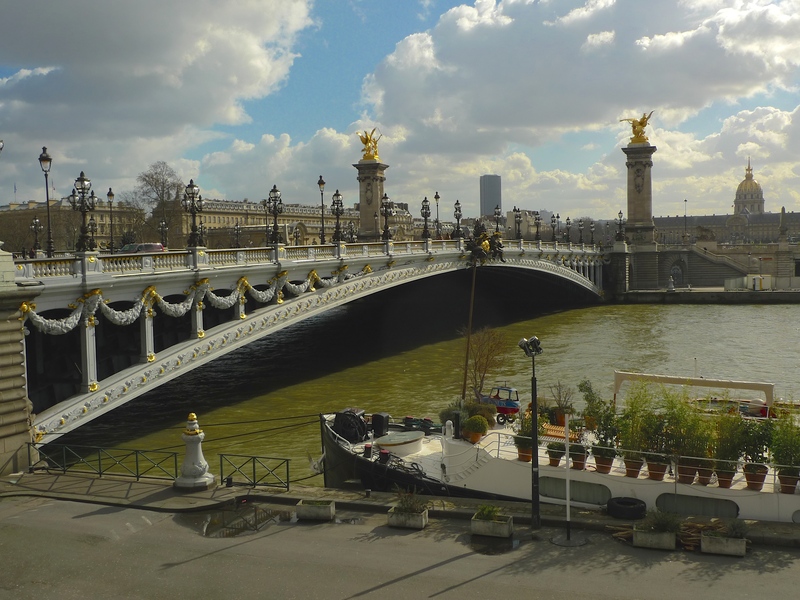 I was in no doubt that the soundscape I’d discovered under the bridge was indeed the unique sound of Pont Alexandre III. Countless people visit this bridge to look at it and to take photographs of it – and why wouldn’t they? It’s extravagant and flamboyant and it’s certainly worth seeing. But I can’t help wondering if I am the only person who visits this bridge to listen to it!